On the backside of the boulder of blue n°12. Start low (crouching start is 7c+). 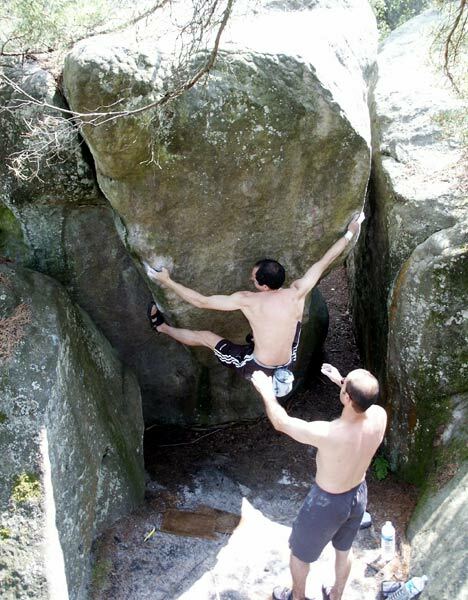 Don't use the boulders around it, that was the only convention for me... And for my size, as a stand-up start from the ground ( no elevation ), i needed to do the two hands dyno start to go in this problem. Some friends can start with left hand in place and can jump to the right hand, and i will have done that if i was taller! Jacky Godoffe has done a crouching start, very low and nearly a sit-start ( avoiding to sit well...) which is way harder to climb! The sit start is maybe still to be done - properly at least - i will have done it too if i was stronger! 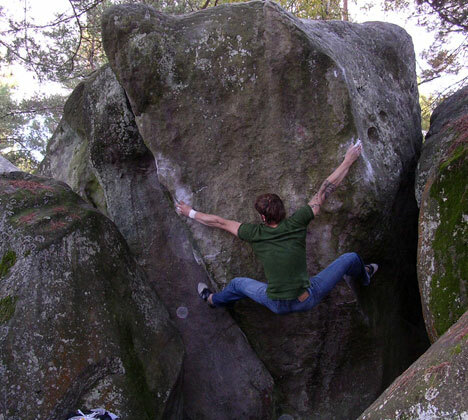 Notice, if you want to practice the tricky upper part, there's also a way with the help from the boulder left for your feet, to avoid any jump starts. Again so, i believe "what's allowed" is a "bad start" for considering boulders. I thought it was actually easier to sit on the ground rather than do a crouching start"
Anyway, always the same subject, to do complex things when they could be just simple. Keep the pad only for falling, that's all. in the 2 videos, both guys do a jump start. allowed or not? thanks for the clarification, Stephan and Neil. definitely time to try that one again then!